So you've decided to use TokenTax to calculate your crypto tax and even file your full return. Good decision! Here's how it all works. First, you'll enter your basic tax information like location, income, and filing status. This will allow us to accurately calculate your tax liability. Next, you import your crypto transaction history by API or CSV. 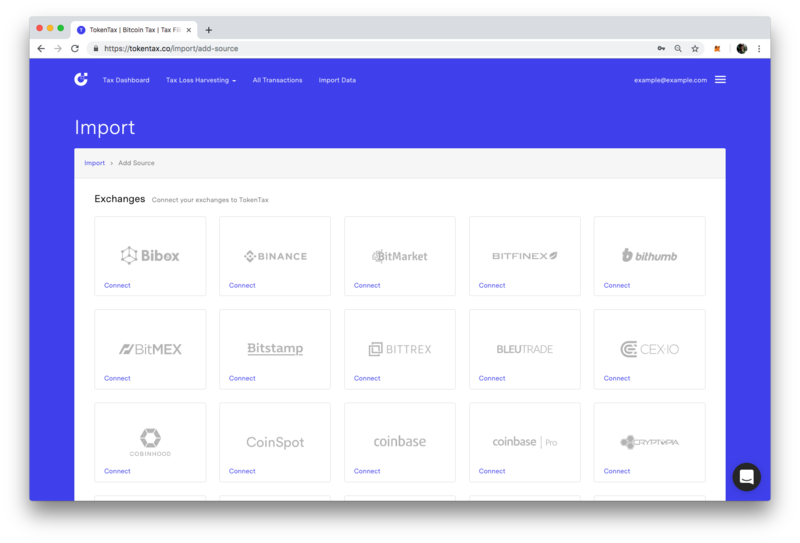 TokenTax supports all exchanges. You can also easily import non-exchange transactions as well, like ICOs, hard forks, any any other forms of income or trade. Any crypto data you have, our experts will work to include it accurately in your tax calculations. Once your data is uploaded, our algorithm uses your transactions and tax information to best calculate your tax liability. You can easily see how your tax liability changes with different specific shares accounting methods like FIFO, LIFO, and Minimization. For many of our clients, TokenTax pays for itself through additional tax savings — and through peace of mind knowing that your taxes are done right. Once your data is calculated and you have chosen an accounting method, your tax forms are ready to export. Download an 8949 to include with your Schedule D 1040, export for tax return software like TurboTax, or simply just let our CPAs take care of it with TokenTax full filing. TokenTax has tools for strategic tax planning as well. 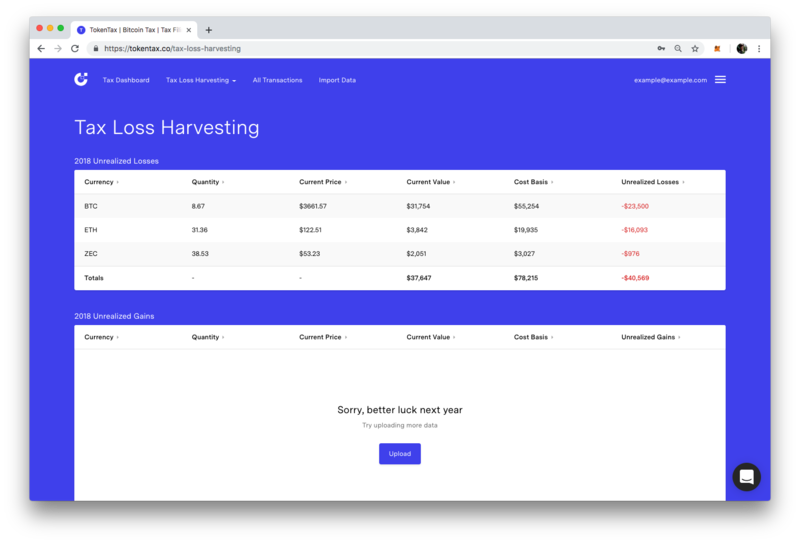 Our Tax Loss Harvesting Dashboard shows you what assets you can sell off to claim crypto losses. It's handy to have when the end of the tax year draws near and you'd like to reduce your tax liability. What makes TokenTax the best in its field? With TokenTax, you can speak one on one to experts who will walk you through crypto taxes step by step. All we do is tax. Other crypto tax services started as portfolio trackers, but TokenTax was founded with the singular mission of doing crypto taxes right. Our algorithm takes into account all variables like your filing state, filing status, and estimated income in order to best minimize your taxes. For example, TokenTax will calculate whether to take a smaller short term gain or a larger long term gain in order to best minimize taxes. Other services will refer you to 3rd party accountants. 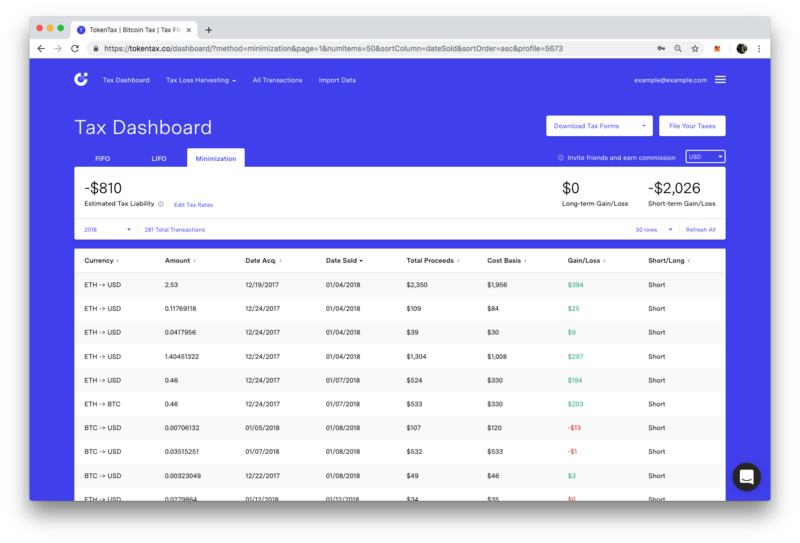 With TokenTax, you can take care of your crypto tax and tax return in one easy, combined process.